Advanced Motor Control Treatment and Training or AMC Therapy has been developed by Dr. Burgess from over 30 years as a PT and 25 years exploring the Feldenkrais Method in PT. AMC Therapy is the result of this experience and learning particularly for the treatment of low back pain. AMC Therapy re-introduces purposeful skeletal spinal action schemas back into motor control therapy for low back pain rather than solely a focus to muscles. AMC Therapy utilizes both modes of motor learning and control. Transform Core Stabilization and Motor Control Theory: The class begins with CS and MC Theory and the practice of abdominal hollowing and bracing. The class advances from controlling muscles to spinal skeletal schemas- abdominal hollowing becomes pelvic and lumbar flexion then becomes whole trunk action. TA contraction becomes a lumbosacral awareness and mobilization tool. Learn to switch between a muscle model and a skeletal model for motor control. This class has been approved for 7 CEU's by the Physical Therapy Board of California. Instantly, this class will increase your success with exercises for low back pain. The shift between muscles alone to muscles and skeleton is powerful and immediate. More difficult to learn but also more potent are the hands on techniques called Mobilizations for Motor Control. Low back pain remains an elusive condition for therapists. Eighty percent of presenting LBP has been categorized as Non-Specific Low Back Pain. A clear definition has eluded and frustrated medicine. Roussouly & Pinheiro-Franco in 2011 stated that this definition for LBP is unacceptable. 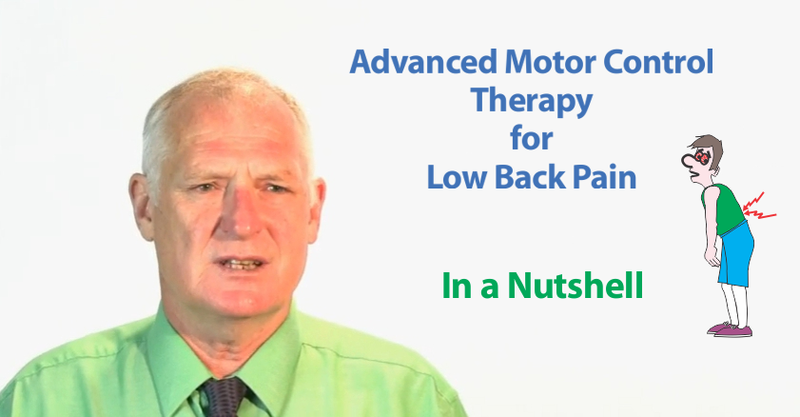 Advanced Motor Control Therapy has been developed by Dr Burgess from 35 years of PT and 25 years with the Feldenkrais Method to provide a new potent theory and treatment for LBP. “the central nervous system knows nothing of muscles, it only knows movements” (Hughlings-Jackson 1889 pg 358). AMC theory postulates, with evidence, that rather than LBP being unstable as has been the popular belief, LBP is actually stiff. Stiffness is Un-Differentiated Action© - if you can't feel it and differentiate it, then you can't and don't utilize it. A loss of low lumbar lordosis and an increase in upper lordosis by excessive co-contraction drives a flat, undifferentiated and stiff back. The very low spinal levels are the stiffest and the most difficult to determine mobility. AMC therapy offers methods to determine L4-S1 mobility. 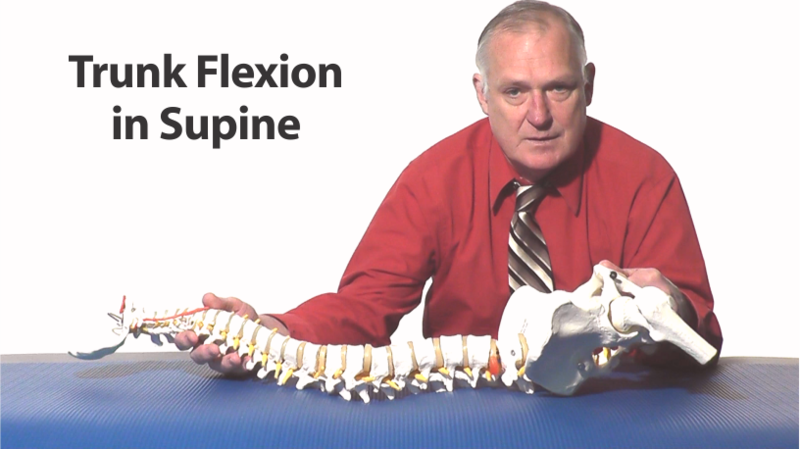 This class will examine the Stiffness Model versus the Instability Model for LBP and the Muscle Weakness Model versus Over Active Muscle Model for spinal dysfunction. AMC Therapy provides an evaluation system to determine the specific mechanical features of LBP - the Seven Kinematic Signs of Chronic Low Back Pain (see below for Trunk Flexion in Supine). And it offers immediate potent motor control exercises for modifying spinal skeletal schemas. Power of the Pelvis. Stabilize or Mobilize? Pelvic Tilt. Which way do you tilt- anterior or posterior? Abdominal Hollowing and Bracing as Skeletal Learning and Training Exercises. Leg-Trunk Coordination©, Arm-Trunk Coordination©- body segments working together. The Hip Abduction Trilogy©. Empowering the Pelvis and Leg. Body Segments or Muscles or Joints? Switching modes. What do Brains do? Lumbo-Sacral Kyphosis: What we can learn from Isthmic Spondylolisthesis Research. Pelvic floor- weak or over active? Strengthening or Skill Training and Stretching? The Old Dog Syndrome for Low Back Pain©. Wagging the Tail or Not. Straight Leg Raise as a measure of Lumbar Mobility and Rigidity. Snakes, Turtles, Salamanders, Dogs, Cats, Snails and other comparative vertebrate functional anatomy for understanding the human spine in action. Trunk Side Bending and Human Locomotion- spinal lengthening is a critical component of normal gait. Immobility creates Instability. Full review of literature on Spinal Instability. Does it exist? The Kinematics of Lumbar DDD. Sagittal Alignment & Mobility of DDD. Six Defining Signs of Passive SLR. Natural History of the Spine and spinal conditions- the Good, the Bad, the Ugly and the Resolution. Seven Classic Signs for CLBP. Kinematic Signs determine Treatment and Training. Lumbo-sacral mobilizations for flexion, side bend and traction motor control. Stretching the Pelvic Floor. 8.30-9.30am. Abdominal hollowing, bracing, pelvic tilt, trunk flexion in supine and leg trunk coordination. Differentiating spinal segments. The Hip Abduction Triology. Movement lesson and exercises. 9.30-11am. Lumbar Geometry, Sagittal Alignment and Kinematics of Trunk Flexion and Extension. Spinal basics of posture and mobility for Normal spine, CLBP, DDD, Isthmic and Degenerative Spondylolisthesis. PSLR- six signs and their significance. Hypothesis for etiology for CLBP. Lecture and labs. 11-12. Lumbo-Sacral mobilizations- flexion and side bending. Hands on practice. 1-2.30pm. Trunk rotation- the role of the pelvis and thorax. Arm-Trunk Coordination. Differentiating spinal segments. Movement lesson and exercises. 2.30-3.30pm. Mobilizing the Thorax. On side and prone. Hands on and exercises. 3.30-4.30pm. Lumbo-Sacral mobilizations in prone. Weight bearing, side bending, rotation and traction. Local, adjacent, at a distance and global mobilizations. The course allows 7 hours CEU's. 8.30-10am. Recap, refresh from Day 1. Pelvic tilt, trunk flexion, leg-trunk coordination. Movement lesson and hands on. Connecting the foot, ankle, shank, hip and lumbosacral spine. Movement lesson and exercises. 11-12noon. Leg, hip and lumbosacral weight bearing, rotation and side bending mobilizations in prone. Mobilizing the foot- metatarsotarsal joint weight bearing, rotation and side bending mobilizations in prone. 1-3.30pm. Isthmic and Degenerative Spondylolisthesis-up to date literature on sagittal spinal parameters and what that means for treatment. 3.30-4.30pm Foot-hip-lumbosacral mobilizations in supine.